Last week I shared with you my decision to blog my way through the book The Love Dare. The book takes you through a 40-day challenge to love your spouse with God’s kind of love. The first dare focused on how love is patient. I love how the book does not simply forget about the first dare when you move on to the next one. You’re not off the hook on being patient with your spouse. Love Dare #2: In addition to saying nothing negative to your spouse again today, do at least one unexpected gesture as an act of kindness. Unexpected acts of kindness were a piece of cake. I mailed him a card, sent him an email just because, and provided him with a few new snapshots of my adorable face. ~~smiling~~ I even told him how much I appreciated everything he still took care of even though he is on other side of the world. When he received news contrary to what he expected, I responded with encouragement. But when he dished out a few more responsibilities, I had to bite my tongue before I snapped again. Kindness came easily until he wanted me to do something I had less interest in doing. A little bit selfish I’d say. Let me be honest on where my selfishness stems from: Jealousy. Believe it or not, I’m jealous of my husband . . . the one serving our country in harm’s way. It became easier to admit my jealousy after a milspouse friend admitted the same. “I was actually jealous that my husband had downtime,” Jana said. She resented the fact that responsibility of the home completely fell on her and her husband had time to read and workout. My husband does not read but the 30 pounds he has lost gives reason to believe he has extra time to work out. I also know his evenings typically end with time for a TV show or a movie. This chapter of the Love Dare says there are four basic core ingredients of kindness: initiative, gentleness, helpfulness and willingness. To provide an example of these four core ingredients, the book refers to the parable of the Good Samaritan in Luke, chapter 10:25-37. If enemies can do it, shouldn't I be able to do the same towards my husband? Initiative. The new responsibilities my husband dished out this week could have been avoided if I would have taken the initiative to try and resolve them before even bringing the matters to his attention. I need to see the need and make a move first. Gentleness. When he talks about his down time, I need to be sensitive and remember he would much rather be home with his family. My friend Jana shared from her experience: “Being able to comprehend how lonely he was helped me to act with more kindness towards him and be more compassionate in our interactions.” I’d much rather show my husband tenderness by being grateful for the opportunities he has to decompress considering the job he has volunteered to do. Helpfulness. The book suggests providing a listening ear. With my husband on the other end of the world, giving him my full attention when he calls is probably the most helpful thing I can do for him. Willingness. Instead of being stubborn when he tries to help with a matter, I need to look for creative ways for him to still contribute. I’m reminded of how it’s equally hard on him to be away and to know he has had to place additional responsibilities on me. What discoveries about love did I make this past week? I realized a heart check was needed before continuing on with this Love Dare. I don’t want to simply go through the motions and not have a lasting impact. My heart needs to be in the right place. And the right place is? It needs to be all about Jesus. It needs to be about wanting to know Him better and learning what it means to follow Him. He is my motivation to choose love. And His kind of love never fails. It always wins. ALWAYS. I think your responses are quite normal Beth; how awesome that your are addressing them and sharing some of the same feelings (and yes some of them, guilty feelings!) that I am sure many of us feel and try to deal with! I am always reminded of the Proverbs 31 verses when I have feelings of jealousy and bitterness, which makes me strive for a higher standard of Godly womanhood and unconditional love. Beth; I love your picture! Beautiful! Enjoy the rest of your week and have a blessed weekend sweet friend! The book refers to Proverbs 31 quite often. Much wisdom found there. I've often read the chapter and found it unattainable. Then I'm reminded of how we will never be perfect this side of heaven but if we are to follow Jesus we should desire to be more and more like Him which includes learning to love our spouses with an unconditional love. Thank you for your encouragement. I appreciate you. OK, after reading this post, my three words this Wednesday are: I feel convicted. Yup, I've been a grumpy spouse lately. And as proof of this, I also rebelled on Three Word Wednesday by using 4 words. See, a *contrary* week for me. Seriously (though the above has truth in it! ), I really am trying harder to tell my husband how much I appreciate all he does for me. He's put up with a lot in the last several months, as I've had to leave him alone a lot to travel back and forth to help take care of my parents, and now my mom. But, even when he's been less-than-patient, I realize it's because he's looking out for me, and missing me. I'm trying to recognize and affirm more often how thoughtful he's been, and how understanding. Tomorrow, these are going to be my new three words: "Honey, you're awesome!" Thanks, Beth - this was a good one! Those may need to be my three words next week, Sharon. The next dare is Love is not selfish and let me tell you, I've discovered lots of selfishness on my part. But I do love how the book really brings such truth to what love is. And when we begin to put into practice God's kind of love, oh how beautiful it is. Thank you for always making me smile with your comments. You bless me, friend. Wonderful post, Beth. Bottom line - love is hard :) As I read your post, this Scripture kept coming to mind & so I will share it..."And hope does not disappoint us, because God has poured out his love into our hearts by the Holy Spirit who he has given us." (Rom. 5:5). So often I have concentrated on the word "hope" in that verse, missing that God POURS His love into my heart. Once that hit me, I have often, (OK, OFTEN) prayed for God to deposit His love for me when I am not feeling especially loving. Thankfully, He has been faithful to making deposits. Wonderful truths in this post. And, a most beautiful photo! Oh, Beth, what a sweet work God is doing in you during this time. Your marriage will be so blessed by what you are learning and putting into practice. Thank you for sharing your journey with us! Much love! Thank you, Holly. It's been wonderful to see how it has been impacting my conversations with my husband already. Powerful stuff! Love you. Yesterday I had an experience where I had had a very tiring and stressful day. My husband had had the same at work. As we were both resting on the couch, he asked me for something and I felt annoyed. I shouldn't have, but I did! Responding with kindness would have avoided the ugliness that I felt in myself afterward. Plus, he would have truly appreciated my help! Turning to the advice in the Bible is always the best way to go! I'm going to go read over the Corinthians chapter today! Joan, what I love is how God is always moving in our hearts and planting the desire to be more and more like Him. We have our moments of falling short, many moments at times, but I always thank Him that I am not who I once was and for how He is transforming my heart. Thanks for sharing. I've been thinking of you. We need to catch up on chat soon. Love you. Oh girlfriend, I so feel you! I find myself being a bit jealous of my husband too-- and he is still stateside. I have been doing some personal heart checks too, asking God to cleanse it of any nasty black spots and let my mouth overflow the beautiful things in my heart, not the yuck. It is a process, but with God behind it, you are so right-- His kind of love never fails. I'm so glad I saw this on your FB page today. It is just lovely. I pray God blesses your union and your efforts and your husband's and your service to our country. I do very few linkups but this one... is very real and full of growth potential. Love this idea! I'm glad you saw this on Facebook too, Heather. Thank you for your kind words. I'm so glad you joined us for the linkup. I'm touched that this is one you would consider and hope you are blessed from your time of visiting others. I look forward to reading your post. I'd love to hear all about your event in June when you return. That sounds wonderful. My husband and I used this book with a small group. It definitely encouraged me to not coast but to be intentional in loving my husband. Yes - I get frustrated when he has down town and I am cleaning, folding laundry. I agree with Heather about the Love Languages - and want to include Don and Katie Fortune's book on the spiritual gifts with couples - it's all about how the gifts communicate with each other - which was really eye-opening - helped me understand so much). Wishing you much blessing in your Love Dare! I have been meaning to read th 5 Love Languages book too. I've heard so many wonderful things about the book. I believe they also have a military addition. I may just be convinced to go buy. Thank you for sharing and I'm so glad you linked up with us again. Blessings. Hi Beth! I have been trying to be less reactive too. It's funny how I assume he is going to read my mind and know exactly what I need when I need it. Love is not an easy thing, it's hard work. (Of course, if anyone told me that on my wedding day, I'd feel sorry for them.) You are taking steps to be sure that you keep that love alive. So wonderful! You won't be perfect, and neither will I. But we'll keep trying, and I think that makes all the difference. Far from perfect indeed, but I can see the difference it's making in my conversations with my husband already. For that, I am grateful. I'm looking forward to Saturday!! Have a wonderful week, Ceil. 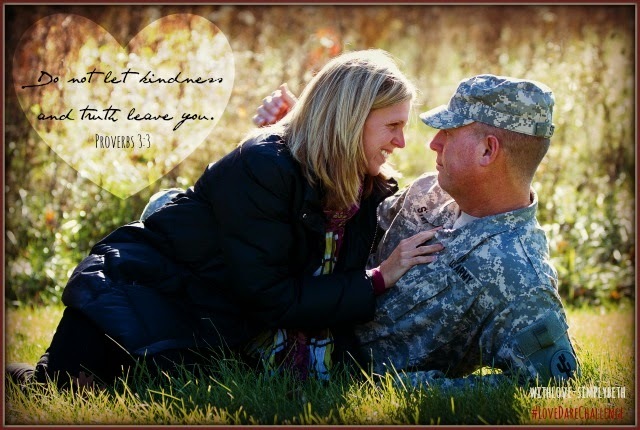 Though I am not a military spouse, I think we can all benefit from taking a love dare. Good stuff to live by and challenge us each and every day! More challenging to you I'm sure. Thank you for a post series that holds me accountable! Much love and hugs to you as we cheer each other on. Hi Beth, we definitely have different situations but I certainly see glimpses of myself in your story. Each of us have opportunities to extend kindness to those we love more. Appreciate you sharing. Hugs to you. My nephew has made safely back to US. Hadn't laid my eyes on yet but thankful that God brought him back safely. Continue to be thankful for your husband and the many serviceman that sacrifice for our country. Hugs to you. I'm just so grateful to hear your nephew is back in the states. Praise God!! Hugs to you, Wanda. This was such a blessing for me to read, and that is the sweetest picture of you and your hubby! God bless you today, sweet friend. Thank you, Ashley. God bless YOU! I have this book and never finish reading it. How selfish is that :) Thanks for giving me the kick I need to try. Sometimes its hard to feel like you have anything left. I can imagine this is multiplied as you are holding everything together on our own. Praying for you and all those women out there that carry so much. That was pretty much what I said when I dropped off a copy of the book to my son. I returned home and was like, "What am I not doing this?" It is hard and there have already been days I really need to push through to stay positing and KIND. Thank you for your continued prayers, Lisa. I appreciate you. Beth, what a beautiful challenge the Lord has given you while your husband is away. Just think how much more beautiful your treasured love will be when he comes home because of God's work in your heart. Your love always shines along with your desire to please the Lord. Blessed to stop by. And I understand how hard this can be for military spouses. Lifting you up. P.S. My title is more than 3 words this week. Hope that's ok. Thank you so much for your kind words, Janis. Your comment truly touched my heart. Thank you. And no problem on having more than three words. I have this habit of reading posts now and finding three words that stand out as I go along so I'm sure they are in there even if not in the title! Blessings to you. "Kindness came easily until he wanted me to do something I had less interest in doing." And also to the jealousy part. I used to be jealous when my husband would be on a business trip, eating out every night, not having to make his own bed or wash clothes, while I was at home keeping the kids and house. So I can't imagine how you must feel. But I admire you for pushing past it. Thank you for stopping by and sharing, Lisa. I always enjoy seeing you here. I do think this is a book that should probably be read at least once a year. It's powerful and good stuff. Blessings to you. Your words challenge me! Oh how grumpy I've been with Ed lately. I need to be much kinder to him. Thank you for the reminder. I have those grumpy days too. At times they are weeks. It reminds me to be grateful for my husbands patience when I'm not so patient. Blessings to you. Dear Beth, I can see Jesus changing your heart. Lasting change. You are becoming a new, better, more complete woman - In Jesus! This is so great and wonderful - AND HARD! Bathing you in prayer today. Thank you for your continued prayers, June. I'm so grateful for you. Your kinds word are a blessings to me. Much love. Oh my your honesty convicts me. I always get so mad at my wonderful husband because he works out every day...it seems for at least two hours. In reading your post I realize yes, I am jealous too. I am jealous that he has such self-discipline, that he has that much time, and that he is lean and strong...and I'm not. Ouch! Thanks Beth! I think I better get me some of that Love Dare. Thank you so much, Elise, for stopping by and honestly sharing with us. I really do appreciate that. I think this book is one we should probably read through once a year. Marriage...it's just hard. Blessings to you. Thank you, Priscilla. This next chapter which focuses even more on jealousy is certainly challenging. And it's so comforting to know I'm not alone in the feelings of jealousy. Thank you for sharing. Blessings. At the root of it all it is really about where our true happiness comes from and when that is in the Lord we have the strength and patience and kindness that we need to love each other. We have proved that over 37 years and living in 3 different countries. You are doing great and always encouraging others too. Thank you for sharing, Sandra, and for your encouragement. Blessings to you. As you know, I've been a little stressed out these days. I haven't been patient or kind toward my husband, at least not as much as he deserves. I am thankful you are blogging your challenges. It will help to get my focus back to where it needs to be -- on the man I love. Hugs! Thank you for stopping by, Barbie, and for sharing. You continue to be in my prayers. I know when we are going through stressful times those husbands of ours are probably first to experience our lack of patience. I'm reminded to be ever so thankful for God's grace even though we fall short. And for my husband's patience when I'm lacking patience. :) Love you so much.